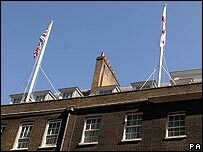 The union flag is flying over Downing Street after Gordon Brown scrapped a rule saying it could be flown only on certain days of the year. The prime minister said it will now be up to individual public offices when they fly Britain's national flag. He said: "When I came into government I realised that you could only fly the flag on 18 days in the year and I thought that was wrong." He said he also wanted to promote British values of liberty and fairness. Mr Brown made "Britishness" a key theme in his pitch for the Labour leadership, often appearing against a union flag backdrop. But he has faced criticism in the past over his calls for a national British day and for praising the American practice of flying the national flag in private gardens. In a speech last year, Conservative leader David Cameron accused Mr Brown of wanting to "institutionalise" being British, arguing it was possible to feel "multiple patriotism" with loyalties not only to where you live, but also to where you were born. "I think we should realise that Britishness is a concept that, if grasped too hard, slips away," the Tory leader added. Mr Brown told BBC Breakfast he wanted to "isolate" extremists and "show how unacceptable the views of terrorist extremists are". But he said he realised there was more to winning "hearts and minds" than flying the national flag. "It is also about how you persuade people that our values about the dignity of human life, about liberty, about our belief in fairness for all, that these are values that define Britain. "And these people who try to present Britain in a different light, we have to take them on. "We have got to take them on culturally, we have got to take them on in newspapers, we have got to take them on in the media."